In August of 2016, I was hired as the strength and conditioning coach for baseball at Washington State University. The baseball team was going through a major rebuilding phase under second-year head coach Marty Lees. The fall ball roster consisted of 23 newcomers and only 18 returners. With this many newcomers to the team, it only made setting my expectations for the team that much easier. I am fortunate enough to have a coaching staff that is 100% on board with what I want to accomplish in the weight room. During the fall semester, I was able to get 13 weeks of mandatory training, and an additional two voluntary weeks at the end. The first eight weeks consisted of fall ball practices, individual sessions, and lifting. We were in the weight room every Monday, Wednesday, and Friday at 6:30 am; while all practices and individuals were scheduled in the afternoon. The first two weeks were spent re-grooving our squat and hinging patterns, teaching main kettlebell movements, as well as teaching major pulling and pressing movements. We would finish all of our workouts with a high-intensity finisher to build our work capacity. Establishing a base for what we will train on until next June is key during this time. The foundation for all of our major movements must be taught and taught again. We will squat (front and back) and pull from the floor (deadlift or Olympic style pull) year round, so establishing these movement patterns from the beginning will eliminate any headaches later in the year. By the end of these eight weeks, the guys are starting to move well and we are ready to increase volume and intensity for the rest of the semester. With fall practices over, our volume and intensity in the weight room increased dramatically. We will still lift three days a week, but now we are also running on Tuesday and Thursday. Both running days will consist of high intensity, low volume sprint and plyometric work. The stakes are high during these competitions, as the entire losing group must complete a predetermined amount of burpees before beginning their lift. After each lift, we will pair the entire pitching staff against the position players. These competitions will vary in length and intensity based on the week. Finishing every week on a high note is crucial for a culture-changing program. It creates a sense of accomplishment, competitiveness, and pride. And most of all, it creates excitement for the next week of training. Week 12 is four days entirely dedicated to competitions. Our roster was drafted into four teams of pitchers and position players combined. Monday morning consisted of a set distance for each team to complete on the Versa Climber, followed by a short relay, and then finished off with the entire team banded together racing through a predetermined route around campus carrying the Cougar Flag. Tuesday morning, each team reported to our Sports Nutrition Department for a surprise hydration test. Each team was either awarded or subtracted points depending on their level of hydration. After hydration testing was done, we headed to the pool for a mix of team and individual relays and challenges. With the weather in Pullman being hit-or-miss, we waited to do Wednesday’s challenges in the afternoon on the baseball field. We had six different competitions for each team to compete head-to-head against. The competitions included: sled push relay, tug-o-war, med ball relay, farmers carry relay, med ball scoop throw, and sled drag relays. Each event included a surprise twist that would require the entire team to work together before or during the event. The final challenge was held on Thursday afternoon. Each team reported to the weight room and we banded them together again for a campus-wide scavenger hunt relay. Before each team could begin, they had to complete a 10 question quiz about the history of PAC-12 Baseball (each incorrect answer resulted in a 30 second penalty). I had eight interns around campus and Pullman with a riddle for each team to solve before they could move on to the next checkpoint. At the final checkpoint, each team had to carry a sandbag, 100lb dumbbell, 32kg kettlebell, and a 25kg bumper plate back to the baseball field for the finish line. We finished the week off with bear crawl harness battle with the finish line being a College World Series home plate. The intensity was through the roof; it was a great way to finish off the week and head into Thanksgiving break. The Washington Nationals won the National League East Division Championship this season, winning 96 ballgames. So, ASAP caught up with the team's strength and conditioning coach, Joh Philbin for this podcast. Philbin, in his 6th year with the 'Nats, has an interesting career...even having a stint as an Olympic Bobsledder! He has also introduced some new concepts to the Nationals in their training program and continues to improve upon strength training for baseball...even while playing a season of 162 regular season contests. Coach John Philbin also was involved in developing an over weighted bat training device that helps to increase bat speed and train the athlete to bring the bat through the strike zone more efficiently and in a straighter line.. It's an aluminum bat for youth players, high school and college athletes. It's called the SWINGXP. And it has endorsement as the Official Training Bat of USA Baseball. Cincinnati Reds Strength & Conditioning Coach Matt Krause and star pitcher Bronson Arroyo explained this shoulder strengthening routine to me. It's a great way to get your shoulders, especially the rotator cuff region, prepared for some serious strength training....... or some throwing! Here's a couple things for baseball coaches and strength and conditioning coordinators. These are fresh off the desk of Cincinnati Reds' Major League Strength & Conditioning Coordinator, Matt Krause. Matt is a contributing member of the ASAP Advisory Board and he always willing to share his information on training the baseball athlete. Imagine keeping a playing roster prepped, strong and conditioned for over 162 games per year! That's Matt's life. He's the best in the business and ASAP~Athletic Strength And Power~ is fortunate to be able to have him as a resource. That's him in the photo above on the right with Ian Douglass of The Burn Machine, ....sporting a Tigers ballcap? In today's blogpost, Matt pitches in two items of importance for coaches and players.... click on the arrows. We're always trying to touch all the bases, so we ventured back down to Great American Ball Park to see Cincinnati Reds Strength & Conditioning Coach Matt Krause. You've seen Matt in our other baseball strength segments known as "POWER HIT with Cincinnati Reds Strength Coach Matt Krause." In this video, Matt Krause explains the nuts & bolts of the Cincinnati Reds In-Season conditioning program.... the one that keeps the Reds on pace toward their goal of a pennant winning season! This Athletic Strength And Power Podcast is brought to you by: One Source Optimal Nutrition.....What's your favorite flavor? Think you've seen and know a little bit about baseball? Imagine being involved with nearly 5,000 games! That's how much involvement in the game of baseball that today's ASAP Podcast guest Dusty Baker has had. Baker knows the history of the game from his days as a kid...with his own heroes. History of the game as a star player. History of the game with today's brand of game and players, too. And he has the stories to go with the experience. For example, in this podcast, Dusty talks about some of the "strength training" that the great Hank Aaron did. He also tells about the evolution of strength training in baseball and how different it was. Presently, Dusty Baker's Cincinnati Reds ball club is in second place... a nice, developing young team that will certainly make a serious run at the National League crown. He also is a big fan of One Source Optimal Nutrition..... STRAWBERRY. So check out this ASAP Podcast. Click on the photo of Dusty Baker or the gray media bar. The rotator cuff is a term used for a complicated area of the shoulder joint, comprised of mainly tendons. However, for the sake of training that area for the prevention of injuries, the muscles can also be considered part of the "cuff". The rotator cuff allows us to extend our arms up over our heads, rotate our shoulders, and throw a ball or object. Other important muscles in this region that need to be considered are the latissimus dorsi, the deltoids, the pectoralis muscles and the biceps and triceps. 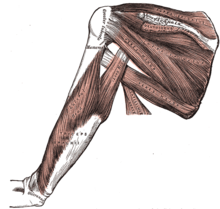 All of the aforementioned muscles play a key role in the function of the shoulder. Athletes, especially those who are required to do a lot of throwing need to pay special attention to this area of the body. Career ending injuries or painful, nagging type injuries have been the demise of many athletes...both professional and amateur. Things can go wrong in this area....including, the aging process- where the shoulder slowly degrades over time, overuse injuries that lead to tedonitis, tears and sprains. Other injuries are due to muscle imbalances and also hard or heavy impact to the region. A specialized program needs to be used to prevent injuries to the rotator cuff. This includes proper strengthening exercise and a regular flexibility program. The following exercises should be included in a comprehensive program for the rotator cuff. Avoid dumbell pullovers, wide grip bench press, behind the neck pulldowns and, if you've had a shoulder separation...avoid dips, too. If you are in the greater Cincinnati or Northern Kentucky region and you are an athlete who does a lot of throwing....quarterback, softball, baseball, track and field events, golf or any other activity that requires constant use of the rotator cuff.... Check out the professional sports personal trainers at The Workout in Covington and ASAP at The Western Sports Mall. They'll be able to help you to target this area and help prevent...or rehabilitate injury to the rotator cuff. Cincinnati Reds Strength & Conditioning Coach Matt Krause hosted his first strength and conditioning clinic last week... many very good speakers on hand. That list included Bronson Arroyo, Chip Morton (Bengals), Billy Hatcher, Michele Macedonio (Nutritionist) and Dr. Timothy Kremchek, the team orthopedic physician of the Cincinnati Reds. That gave us the opportunity to talk about the rotator cuff, etc. for this ASAP Athletic Strength And Power Podcast. Last Saturday, I attended Matt Krause's Cincinnati Reds Strength & Conditionng Clinic. It was a very nicely done seminar.... all at Great American Ball Park. What a great place to have it! And Bronson Arroyo was there... he has a renewed fervor in his off-season training program right now and wants to help the Reds overcome their down year. He's been training down in Naples, Florida and trying to get himself stronger than ever. He's also been working on hip and lower body flexibility as he'll be trying to add some speed to his fast ball this year.... a necessity when you pitch half of your games in a hitters ballpark like GABP. I also got to speak extensively with Dr. Timothy Kremchek. In fact, we recorded a podcast which will be edited and posted on this site soon. Additionally, I spoke with several vendors at the clinic, most notably Jim Hartman of GripForce "Grip4orce Inc." where they are "Revolutionizing Grip Strength" with their very cool product. My first exposure to using the Grip4orce was when I visited Michigan State University last year. Coach Mannie had many of the machines there outfitted with these training tools.There's a host of other bigtime pro and collegiate programs using these things now. Basically it's a rubbery device that the athlete has to squeeze down while using dumbells, barbells and machine grips.....and it forces the trainee to activate more muscles while performing many different exercises. I liked them so much, I got a pair of them.... there are two sizes...or "tensions" to choose from: Regular and Stiff Flex. (Of course, I chose the more difficult model). I have just started using them in my training and I have to admit....I can really feel the difference at the end of the routine. And trust me.....price won't scare you away: $39 bucks! In this episode of "Power Hit", Matt Krause & star pitcher Bronson Arroyo discuss the upgrade to the weight room at Great American Ball Park...the Home of the Cincinnati Reds. ASAP~Athletic Strength And Power Video Producer Ed Cicale went behind the scenes, and through the dugout to catch Reds' Strength & Conditioning Coach Matt Krause for this one. Krause will host a strength training seminar at GABP in November. We'll post more details soon. Bronson Arroyo will join him for that event which promises to be great for coaches, athletic trainers and personal trainers. Arroyo, both weight room fanatic and accomplished guitarist, sings the praises of strength training...and it's paying off! He leads the majors in innings-pitched just about every year. Talk about durable.